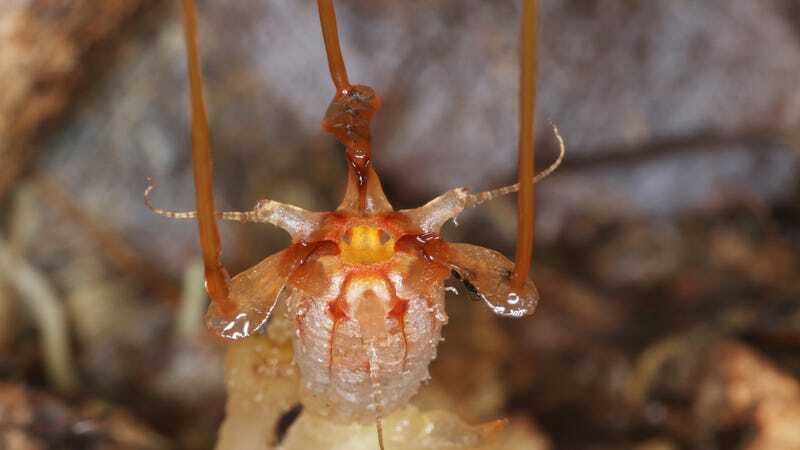 T. neptunis, an elusive fairy lantern photographed in Borneo for the first time in 2017. Mycoheterotrophic plants—plants that shun the Sun in favor of stealing food from root-associated fungi called mycorrhizae—are notoriously elusive, spending much of their time below-ground. This particular mycoheterotroph, Thismia neptunis, had been spotted just once before, in western Sarawak, by 19th century Italian botanist Odoardo Beccari. Its genus, Thismia (also known as the fairy lanterns), includes nearly 80 described species, many of which have only been discovered recently. Okay but seriously, we sure this thing isn’t an alien? Lucky though they may have been, Sochor and his colleagues didn’t come across the illusory T. neptunis completely by accident: they were in the very forest where Beccari discovered the original type specimen, and they “believed the species was still there.” Their intuition was rewarded in January 2017, when additional specimens of the parasitic plant were discovered and photographed for the very first time. Sochor told Earther that he has “no idea” how widespread the species is, and that information on the distribution of related taxa is no help, since pretty much all species are scarce. “It would not surprise me, if the species [occurred] just in the one particular forest patch,” he said. T. neptunis’ habitat in Borneo. Sochor and his colleagues are currently finishing their description of several new Thismia species, which he says were also discovered during last year’s expedition. The botanists are also trying to gain new insights into the ecological roles fairy lanterns play. According to Sochor, these may be minor due to the generally limited distribution of the plants.